Hanoi (VNA) – A workshop on the conservation of the grey shanked douc langur in the Central Highlands province of Kon Tum took place at Mang Den ecotourism site in the province’s Kon Plong district on March 25. 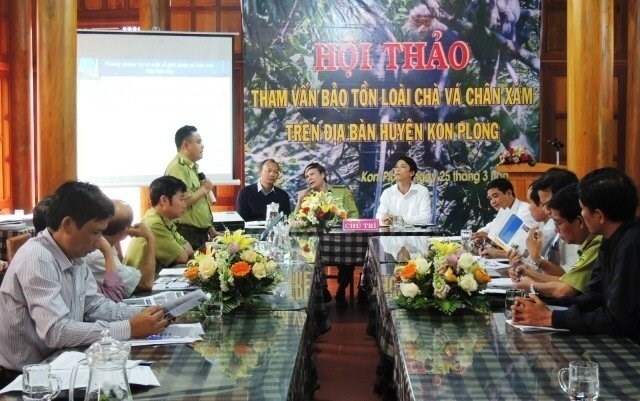 The event was held by the Forest Management Department of the province, Greenviet Biodiversity Conservation Centre and Fauna & Flora International (FFI). Reports from scientists, administrators and local authorities were delivered at the workshop, proposing solutions to protect the wild animal in the locality. Vietnam is home to between 1,500 to 2,000 primates of this kind in forests across Quang Nam, Quang Ngai, Binh Dinh, Kon Tum and Gia Lai provinces. It is included in the International Union for Conservation of Nature red list as one of the world’s 25 most endangered primates.